These beautiful 5-Spoke 22-inch chrome accessory wheels take maximum advantage of Silverado`s ability to handle large-diameter wheels. Faceted forms available in a lustrous finish make an emphatic style statement. 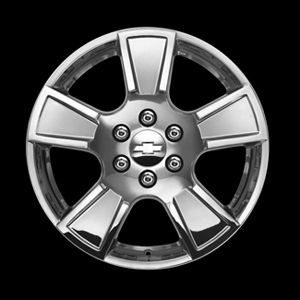 Chevrolet accessory wheels are available with a choice of matching Chevrolet Bowtie logo center caps and chrome lug nuts. Use only GM-approved wheel and tire combinations.